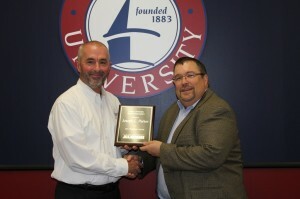 Our Founder and CEO Joe Parker was recently honored with the 2012 Cleary University Alumni President’s Award. The President’s Award is presented to an outstanding alumni who not only has a passion for Cleary University, but who also serves his or her fellow alumni and alma mater in a positive and impactful way. It is given to an individual that has shown above and beyond support and is a true pillar to the University. Please help us in congratulating Joe Parker for this wonderful achievement!